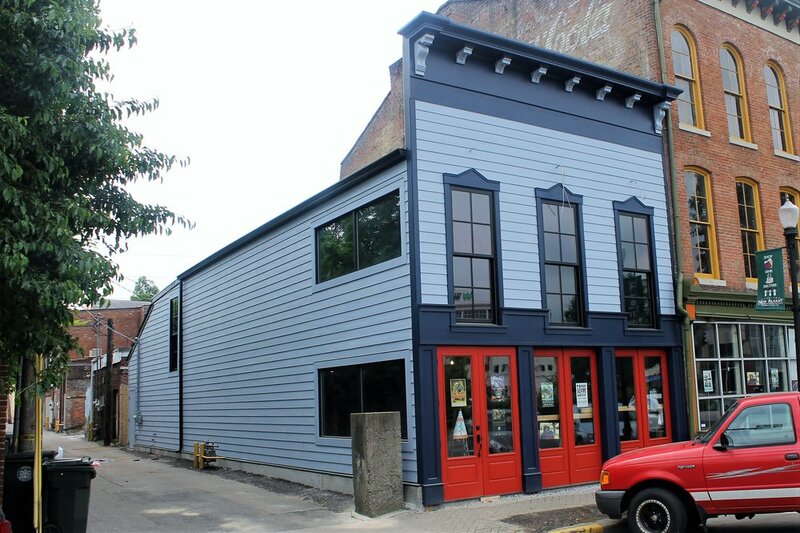 The City of New Albany’s Downtown Façade Improvement Program is underway. This program was designed to assist building owners in the Downtown Historic District improve the facades of their historic structures. Property owners will be reimbursed for 75% of the cost of façade improvements (up to $100,000), with property owners paying 25% of the work. The old Good Times bar on Market St.
Renovated facade, set to be the home of Pints & Union. New Albany has a plethora of beautiful, historic buildings in its downtown. Unfortunately, over the years, some of these buildings have had windows shuttered and closed off, original brick walls painted over, and historic character lost. Some buildings have even been painted together to appear as one structure. This project will seek to revitalize, refurbish, and redevelop buildings and facades in the downtown area, reinvigorating these historic structures to their original historic look, including improved windows and uncovered original brickwork. The Schmitt Building, before Facade improvements began. Work is underway at Schmitt Furniture to remove the old paint and improve the facades of multiple buildings along State Street. Twenty-five (25) separate façade improvement and historic preservation projects are underway, totaling $1,000,000. Some of the façade improvements began last fall, but the majority of the work is being completed now as the weather starts to warm up consistently. Jerry Finn, Executive Director of the Horseshoe Foundation of Floyd County, is excited to see the work begin. "When the Horseshoe Foundation committed $20 million to have the YMCA built fifteen years ago, a board member noted that we need to continue to pay attention to our community to enhance economic development. The Foundation’s commitment to this project is a way to preserve the beautiful historic structures of the city as well as encourage the growth of business. We are excited to see the transformation of these buildings and streetscapes which will improve quality of place in our community," stated Mr. Finn. Construction will begin soon on another project under the grant from Horseshoe, a beautification and median-improvement project along Market Street. This project aims at both beautifying and improving the safety and walkability of the Market Street corridor, while retaining the unique historic feel. It will include enhanced crosswalks and intersections with decorative pavers, improved pedestrian safety and walkability, all with a focus on the historic character of the area. Work will also be done to enhance the overall tree canopy with native and proper species and improve the landscaping and foliage for both beautification and improved safety and sight-lines. Special thanks to the Horseshoe Foundation of Floyd County for funding these wonderful projects in downtown New Albany!